You can earn up to $30 statement credit for making gas and grocery purchases through your AmEx cards. This offer is only for the first 30,000 Consumer or Business American Express Cards to be successfully registered online between April 30, 2015 and May 30, 2015. 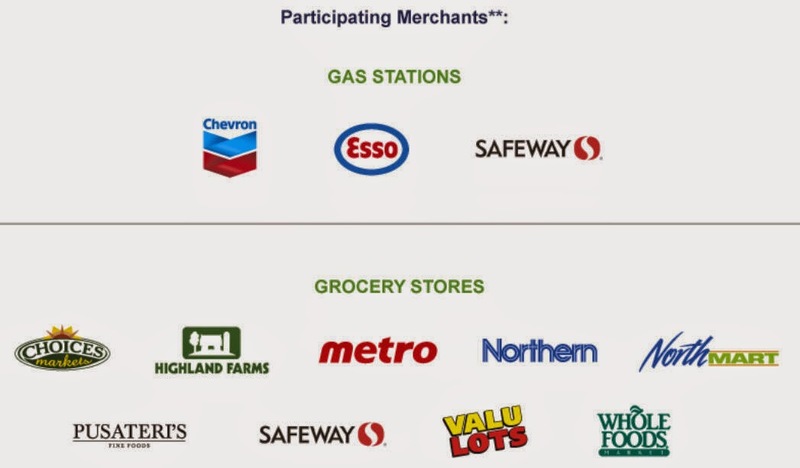 Once registered, each time you shop at any of these participating merchant locations in Canada and make a single purchase of $50 or more in a single transaction (including taxes), to your registered Card, you'll earn a $10 Statement Credit. Up to a maximum of three statement credits per Registered Card. You can get a $10 Bestbuy.ca savings certificate with any reserve-and-pick-up order over $100. This offer is for online purchase placed between Apr 28 to Apr 30. Savings certificate will be emailed to you within 14 business days, and it is redeemable online at bestbuy.ca. Honestly speaking, this offer is small, only $10 (< 10% discount), but still better than nothing. Note: this certificate expires on Jun 14, 2015. You can earn up to 40,000 TELUS Rewards points by getting a CIBC TELUS Rewards Visa card and a new CIBC Chequing account (CIBC Unlimited Chequing account, EverydayPlus Chequing account, or PremierService account). 1. You can earn 10,000 TELUS Rewards points after you pay a bill or send an INTERAC e-Transfer using CIBC Mobile or Online Banking services. 2. And you can receive an additional 30,000 TELUS Rewards points after you set up and complete a direct deposit OR 2 eligible pre-authorized payments from the new account. TELUS Rewards points can be redeemed for TELUS products, including smartphones, tablets, travel passes, prepaid cards accessories and charity donation. 40,000 TELUS Rewards points = $400. 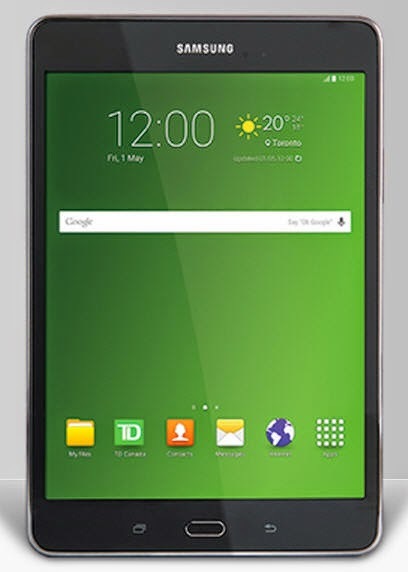 If you are about to purchase a new smartphone from TELUS, you may want to consider this offer. On April 24, the CRA issued a communication to some Canadians that referred to an incorrect filing deadline for 2014 tax returns of May 5, 2015, rather than April 30, 2015. The CRA takes full responsibility for the error. As a result, 2014 tax returns filed by midnight on May 5, 2015, will not incur interest or penalties. Offer ends on Apr 28. You need to use promotion code: SALE3. And the maximum discount per deal is $50. One suggestion is to buy: "$22.99 for One $20 Esso Gift Card and One PRICE PRIVILEGES Fuel Savings Card from Esso (Up to $30) ". With 20% off, you only need to pay $18.39 for this combo ($30 value). 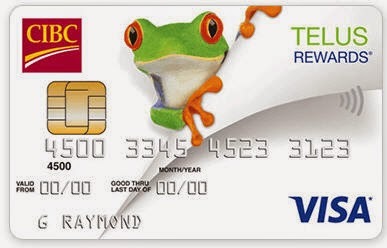 CIBC and TELUS announced a new credit card last week: the CIBC TELUS Rewards Visa card. There is no annual fee for this card, and you can earn TELUS Rewards points that can be redeemed for TELUS products, including smartphones, tablets, travel passes, prepaid cards accessories and charity donation. As you earn more points on your CIBC TELUS Rewards Visa Card, you can start redeeming at 500 points (500 points = $5). 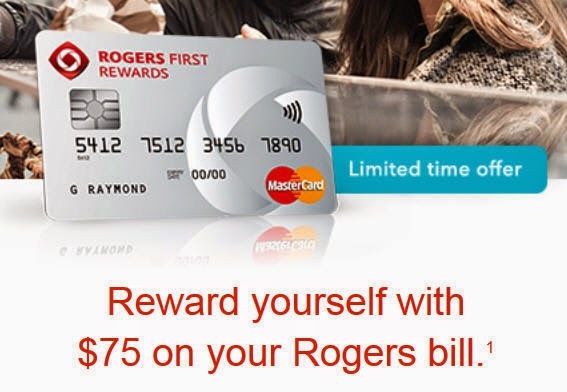 Rogers has a similar rewards credit card: Rogers First Rewards MasterCard. Honestly speaking, I think Rogers First Rewards MC is better than CIBC TELUS Rewards Visa, because the Rogers one can provide 1.5% - 2% return, and it is a MasterCard (good for Costco). 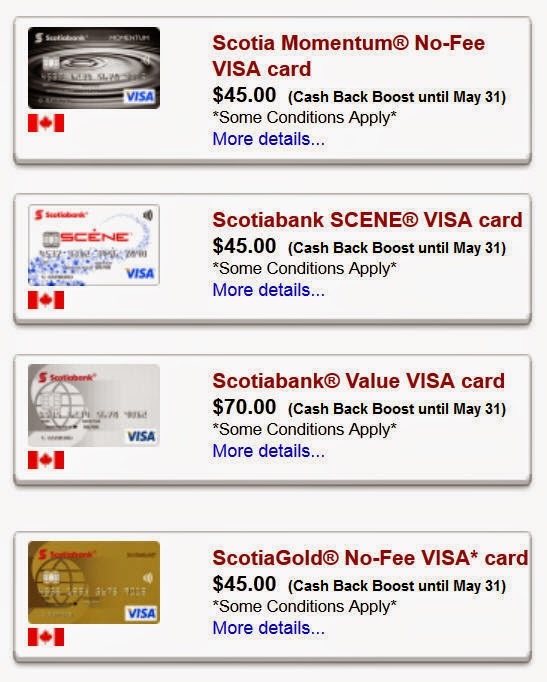 GCR has an awesome promotion on many Scotiabank credit cards right now. When you sign up for those credit cards through GCR before May 31, you’ll get a $45 - $70 cash back once approved. From my point of view, $45 bonus for a no-fee credit card is pretty good. If you want to sign up for GCR, please use my referral link as follows: https://www.greatcanadianrebates.ca/Register/126795/ , and GCR will give you extra $2.5 bonus (I will also get some bonus. Thanks). Best Western Rewards members who register for this promotion and stay any Best Western branded hotel in the United States, Canada or the Caribbean before Aug. 31, 2015 will earn 2,000 Aeroplan Miles per stay. Usually, you can only earn 250 Aeroplan Miles per stay at Best Western hotels. Note: In your Best Western Rewards account, you need to choose Aeroplan as the earning preference. Online registration is needed for this offer. Shoppers Optimum: Spend your points event! Normally, you can redeem 50,000 Shoppers Optimum points for $85 and redeem 95,000 Shoppers Optimum points for $170. But on Apr 25 & 26, you can get extra $15/$30 when you spend your Shoppers Optimum points. Note: offer excludes prescription purchases, products with codeine, non-pointable items, tobacco products, stamps, passport photos, lottery tickets, event tickets, transit tickets and passes, gift cards, prepaid phone cards, prepaid card products and Shoppers Home Health Care locations. I think the the yearly PP lounge membership and 4 passes alone cover the annual fee of this credit card. BTW, this card cannot be churned (you can only get the $300 credit once in your lifetime). 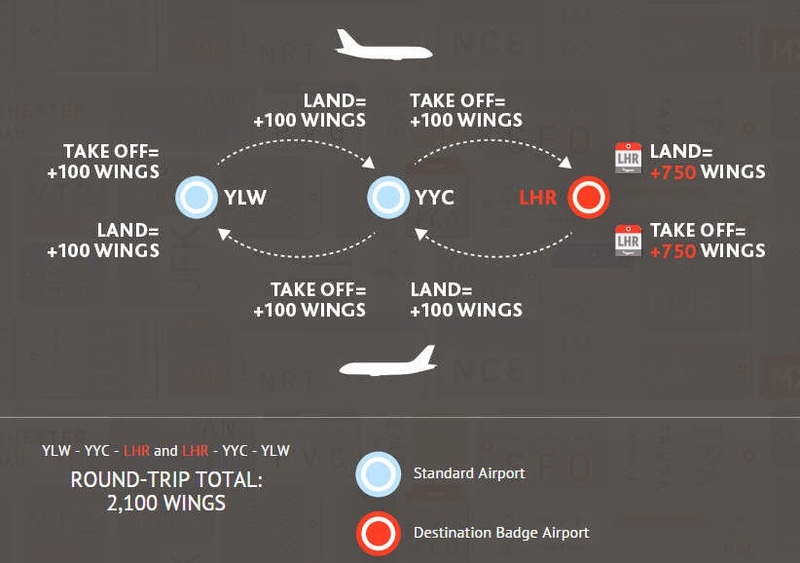 Air Canada "Earn Your Wings" (the 4th edition) is back. It is similar to the 3rd edition, and it is exclusive for Air Canada Altitude members. You can have the opportunity to earn tons of bonus Aeroplan Miles. You’ll earn Wings for all of your flights with Air Canada (including flights operated by Air Canada Express and Air Canada rouge), and completing certain challenges. The more badges and Wings you collect, the more bonus Aeroplan Miles you'll earn. In Budget 2015, the federal government almost doubled the amount that Canadians can contribute to TFSA each year from $5,000 to $10,000 effective immediately. Unlike other savings methods such as RRSPs, contributions to the TFSA accounts are after-tax funds, but can grow tax free indefinitely. Nearly doubling the limit is great news for savers and investors, but it also represents foregone future tax revenue for governments. By the government's own estimates, the extra room in the accounts will cost government coffers $85 million in the current fiscal year, jumping to $360 million annually by 2019. Five years on, that's $1.1 billion in foregone revenue. Enjoy faster fuelling with Speedpass and you can earn up to $20 in Statement Credits! You need to register this promotion online first. Once registered, link your registered AmEx Card to your Speedpass key tag (if you don't have a Speedpass key tag, you can enroll for a new Speedpass key tag now). Then use it to make a purchase of $45 or more (including taxes) between April 21 and July 31, 2015 and you can earn a $10 statement credit. Up to a maximum of two Statement Credits per registered Card. 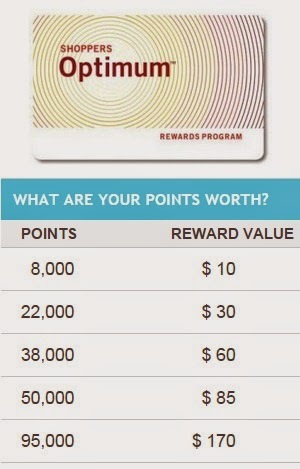 If you buy 20,000 points, the price is USD $525.00. SPG usually has this kind of promotion twice a year. 25% off is the best price you can get from SPG. BTW, before you make the purchase, I would suggest you to apply for a AmEx SPG credit card. Once approved, you will get 20,000 bonus SPG points (only need to pay CAD $120 for the 1st annual fee). A Priority Pass member will lose access to all United Club lounges, effective May 15, 2015. This includes all 49 United Clubs in 34 airports (26 US airports and 8 international airports). For United lounge access beyond May 15, travelers can pay US$50 per visit at the door. That’s a loss for some Priority Pass members (including those who have the BMO World Elite MasterCard). Priority Pass did advise that alternative lounges are available at 17 of the 34 aiports affected. WestJet two-day sale (Apr 16-17) is now extended to Apr 22. You can find some good fares for travel in Canada, to USA and Mexico/Caribbean. Book by April 22, 2015 (11:59 p.m. MT) for travel on Tuesdays, Wednesdays, Thursdays and Saturdays until June 24, 2015. Blackout dates from May 14 to 19, 2015. Note: bookings are non-refundable, and advance purchase is required. BMO Air Miles MasterCard: No annual fee. It offers 1 Air Mile for every $20 spent. You can earn 500 bonus Air Miles once you get approved for this card. You can get 1.25X AIR MILES reward miles at all Shell locations in Canada, and 1.5X reward miles with up to 25% off rentals at National Car Rental and Alamo Rent A Car locations worldwide. 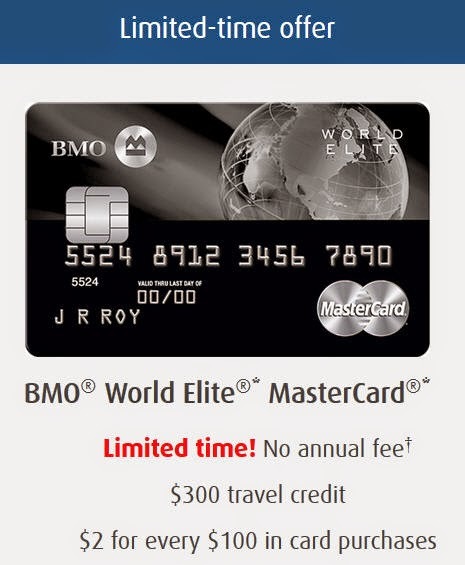 From my point of view, this BMO Air Miles World MasterCard is not very attractive. At 1 Air Miles per $15, you'd need to spend more than $15,000 to get 1000 Air Miles. But with 95 Air Miles = $10 ration, this is worth around $100 (so, just pay off the annual fee of the card). If you want to redeem Air Miles for flight ticket, you need to do a lot of homework to get good values (the Air Miles program is more complicated than Aeroplan or RBC Avion program). In May 2015, the 25% flight discount will only be available on lights in North America. Also in May 2015, only the first $7,000 in monthly purchases will earn Air Miles. Maybe it is time for people to cancel the BMO Air Miles credit cards. Buy a movie ticket at cineplex.com using Visa Checkout and receive one promo code for a Free Move General Admission. The code is on the last page of the PDF ticket. You need to use this code before Aug 3, 2015. An applicable surcharge will apply for IMAX, UltraAVX, UltraAVX-3D, VIP (19+) admission or Digital 3D presentation. Tuesday tickets do not generate a code. This is a good deal if you're buying cineplex movie tickets online. It took me 3 mins to create a Visa Checkout account during booking (for "Furious Seven"). I bought one ticket online first using Visa Checkout, then used the code for the 2nd ticket. With Visa Checkout, you don't need to fill out your payment and shipping info every time you make a purchase. All you have to do is register any of your major credit, prepaid or Visa debit cards once. When it’s time to checkout, just enter the username and password you registered with. It is similar to Paypal, and you can register with MasterCard/AmEx as well. Any travel plan for the summer break? Startwood Resorts just provided some early bird offers. 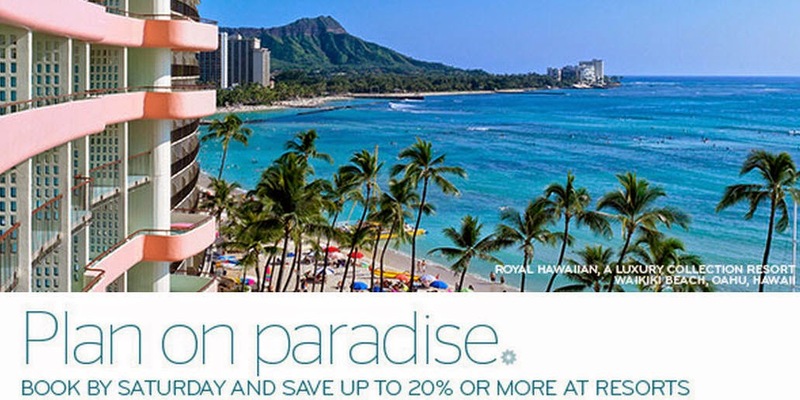 If you book hotels at participating Starwood Resorts in North America, Latin America and the Caribbean by Apr 18, you can save up to 20% at resorts for travel between Jun 15, 2015 through April 30, 2016. Besides, SPG members can save an extra 5%. From Apr 15 to Apr 19, all Aeroplan members who shop through Aeroplan’s eStore will get 5X the miles on all their purchases. IHG Rewards Club announced some new changes to the program. IHG introduced a new membership level above Platinum. To achieve this new top tier elite level, you need to earn 75,000 qualified points or 75 qualified nights in one year. This new tier level will get 100% bonus points on qualified stays, which is the first program in the industry. Members of this newest level will be able to choose between receiving 25,000 points or upgrading a friend or family member to Platinum status, as part of the Choice benefit. IHG also lowered the thresholds to qualify for Gold and Platinum levels. Members will need to earn just 10,000 qualified points or 10 nights to be eligible for Gold status. Members will need to earn 40,000 qualified points or 40 nights to reach Platinum status. Because IHG made it easier for members to earn Gold and Platinum status, all Fast Track to Elite status offers will be discontinued as of Jun 30, 2015. In addition, IHG is also changing its point expiration policy so that now all points will expire after 12 months of inactivity. If you are a current elite member of IHG Rewards Club, your points won't expire. Elite members who do not earn enough qualifying nights or points to maintain their status will become a Club level member. Points will expire 12 months after becoming a Club level member for those who neither earn nor redeem at all during this time. 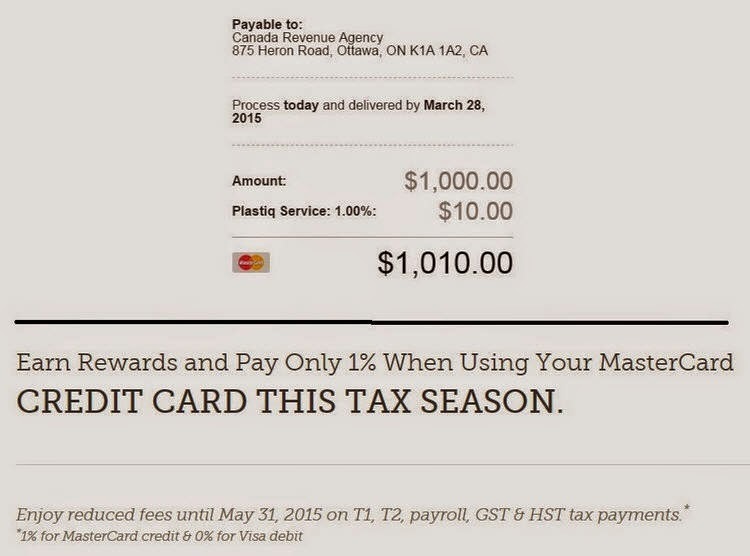 As you know, the CRA does not offer the option of paying taxes using a credit card. However, you may be able to use a third-party service provider that offers additional payment methods, including credit cards. The only provider that can do it at this time is Plastiq (T2 corporation, T1 individual, GST/HST, source deductions and excise tax). Normally, Plastiq charges a fee of $1.99-$2.49 for this service. Currently, there is an offer from Plastiq: reduced fees until May 31 on tax payment (1% for MasterCard and 0% for Visa Debit). I tried it myself and the Plastiq service fee is really 1% for MasterCard. This is good for those who have credit cards with rewards greater than 1%. Please remember that even if you pay today, the CRA may not receive your payment today. The transfer will typically take place within two to three days. However, you may encounter additional delays. The CRA may charge you penalties or interest or both if your payment is late. Between Apr 6 and May 25, you can earn USD $50 Best Western Travel Card when you complete two separate stays at any Best Western hotels worldwide. Online registration is needed. Best Western Rewards members who have qualified for the promotion and have a valid email address in their account profile will receive a virtual (by email) $50 Travel Card usually within 2-3 weeks after they have completed the second qualified stay. The member must have a valid email address on file for award delivery. Effective May 11, 2015, there will be some enhancement to the Wyndham Rewards Program. The new Wyndham Rewards program is quite unique compared with other Hotel Programs in the industry. Go Free awards: With just 15,000 points, members can redeem a free night at any Wyndham Rewards hotels with no blackout dates. Go Fast awards: Points + Cash option. Members can book a night at available hotels for just 3,000 points plus cash. Go Get 'em awards: For every qualified stay, members can earn 10 points for every dollar spent or a minimum of 1,000 points per stay, whichever is more. 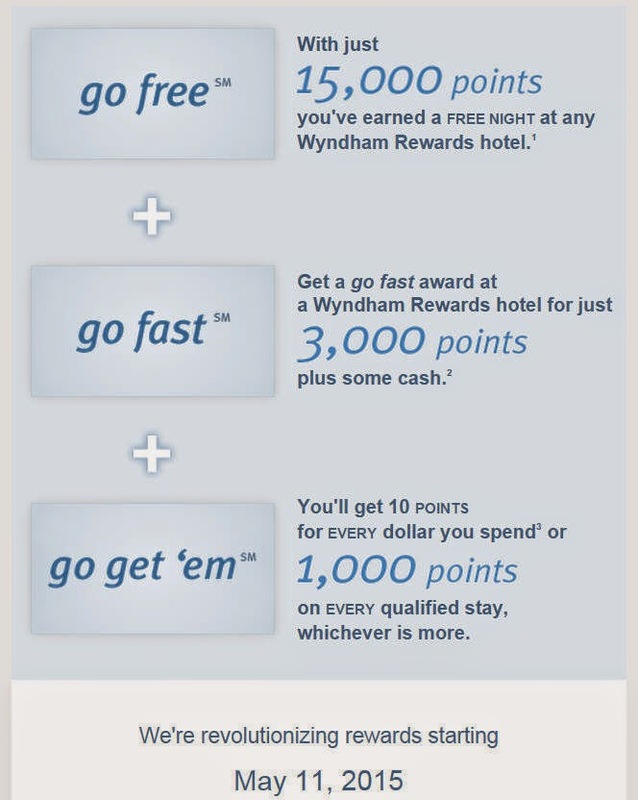 Wyndham is also simplifying the earning of Gold Status Point Bonuses. Under the revised program, Gold Status Members will earn 15,000 Wyndham Rewards points after their 20th, 40th and 60th Qualifying Nights regardless of the average rate they paid (for a maximum of three Gold Status Point Bonuses in a calendar year). Gold Status Points will be redeemable for go free awards and in connection with go fast awards at participating hotels. These changes are mainly good news for Wyndham Rewards members. Go free awards and go fast awards will help members redeem points for stays at hotels more easily, quickly and with greater flexibility than ever before, and go get 'em awards will help members earn points more quickly than ever before. If you are a frequent member of Wyndham hotels, I suggest you to stay in low tier hotels for at least 20 stays (for example $70/night, total cost $1400). Then you will get 35,000 points (1000*20 + 15,000), which is enough for 2 nights in high tier hotels (for example $360/night, total return $720). Have you heard of Meridian Credit Union before? Meridian Credit Union was formed April 1, 2005, following the merger of Niagara Credit Union and HEPCOE Credit Union. It is the fourth largest credit union in Canada, and the largest credit union in Ontario. On Apr 9, Meridian announced an 18-month fixed mortgage at 1.49%, which is the lowest known posted mortgage rate in Canadian history. Meridian also provides a good repayment options on the market. Meridian’s 20/20 prepayment program allows Members the option of paying down up to 20 per cent of the original principal balance without penalty each year. I have to admit that this 1.49% mortgage is amazing (or "crazy"). 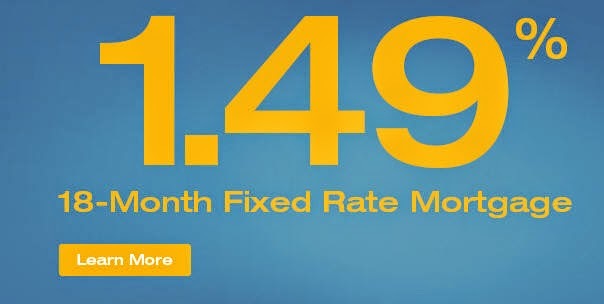 BTW, at the same time, Meridian provides 1.6% interest rate on its high interest saving account. American Airlines AAdvantage and US Airways Dividend Miles merged on March 28th. 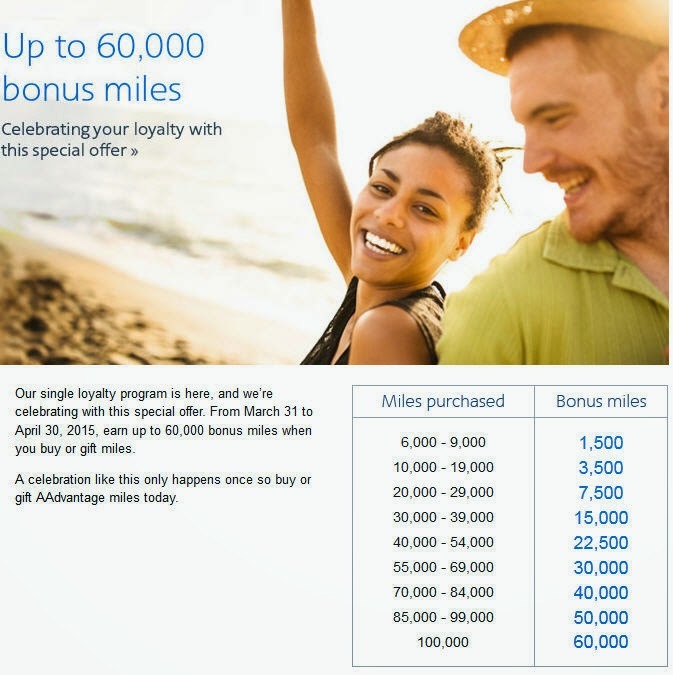 To celebrate this event, from Mar 31 to Apr 30, you can earn up to 60,000 bonus miles when you buy or gift miles. The cost of this promotion is around $0.02/mile. 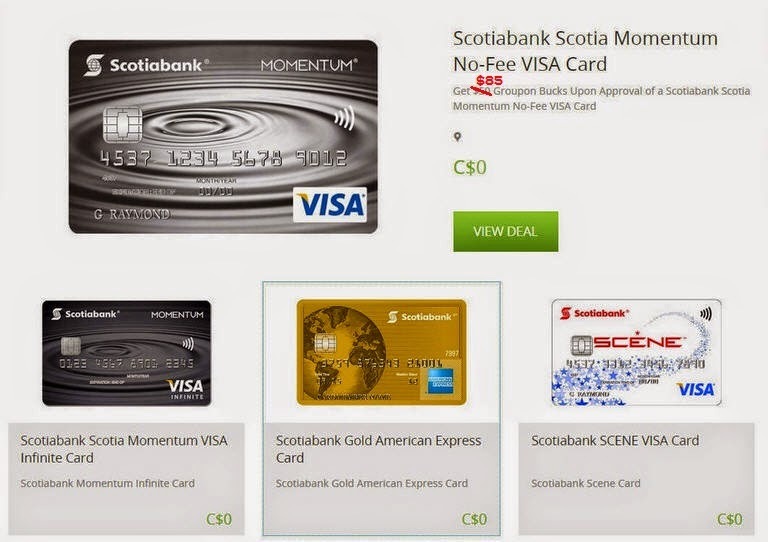 Apply for a Scotiabank credit card by Apr 22, 2015 and get $85 in Groupon credit when your application is approved. Limit 1 credit card application per customer. You cannot "Buy for a friend" for this deal. This is a quite good offer, and the offer was $50 Groupon credit just a few days ago. Aeroplan announced a promotion for people converting partner loyalty program points (hotel, car rental, and points.com) to Aeroplan for bonus. This kind of offer normally happens twice per year. Maximum 25,000 Bonus Aeroplan Miles can be earned per Aeroplan Member. Bonus offer valid only on conversions made between March 30 and April 27, 2015. Unfortunately, AmEx MR points and CIBC Aventura points are not eligible for this promotion. 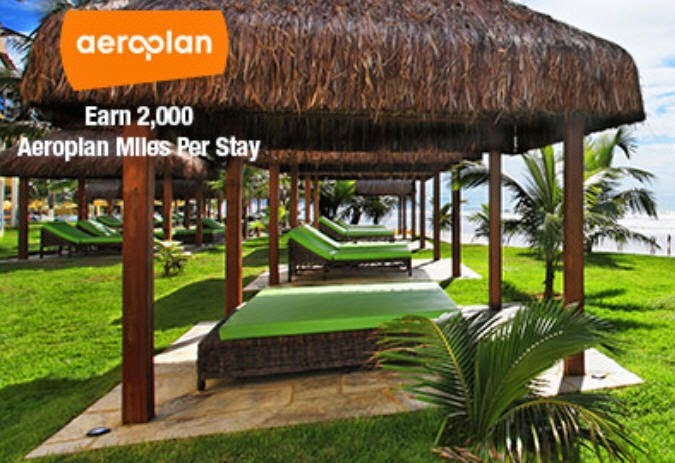 If you are a SPG collector you can convert 20,000 SPG into Aeroplan and get 29,000 Aeroplan Miles. If you have Esso Extra Points, you can convert them into Aeroplan through points.com. 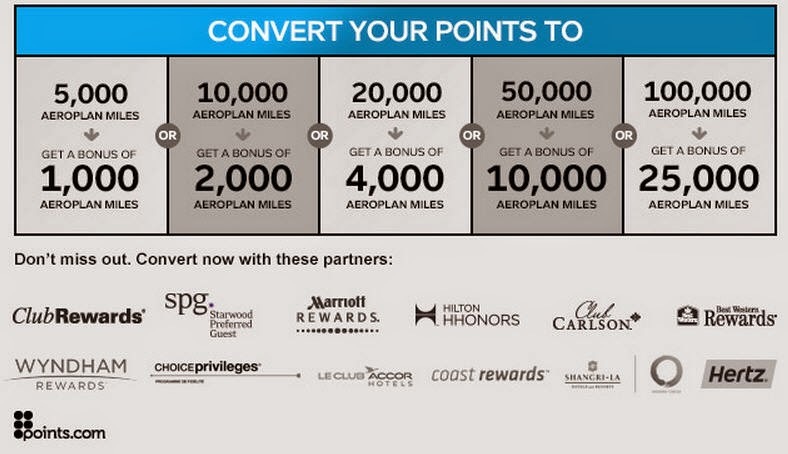 You can convert your points into Aeroplan with many different partners. Aeroplan will combine all the miles you have received so that you can earn the most bonus Aeroplan Miles possible. Hope you enjoy this Aeroplan promotion. From Apr. 1 to Jun 30, PC Financial provides promotional interest offer 2.6% on new deposits to all eligible accounts (Interest Plus Savings and No Fee Bank Account). Only primary account holders are eligible for this offer. It does not apply to registered accounts or other banking products. To participate this promotion, you need to register by May 15 by calling 1-866-747-8129 or visiting an in-store President's Choice Financial pavilion. It seems that you cannot enroll this offer online. I called PC and got enrolled in the promotion. The CSR said he will send me a confirmation email in the next few days. This is better than the current Tangerine 2.1% promotion, and I will move money from Tangerine to PC Financial. The Shoppers Optimum rewards program is one of my favorite rewards programs in Canada. The Shoppers Optimum card is accepted at participating Shoppers Drug Mart stores and any other designated locations across the Canada. You can earn 10 Shoppers Optimum points for almost every dollar spent, including prescriptions (points cannot be awarded on prescriptions in all provinces). You can collect Shoppers Optimum points even faster with valuable Points Events like 10X/15X/20X the points in-store. And you can also get bonus points on specially marked items in Shoppers Drug Mart every day. Remember to register and receive email offers, exclusive for Shoppers Optimum members. 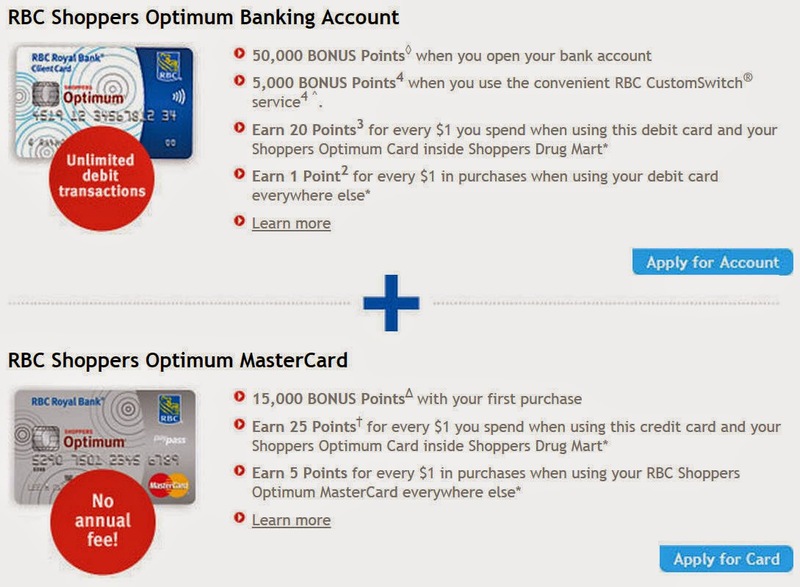 If you want to earn Shoppers Optimum Points on purchases outside of Shoppers Drug Mart, you can open a RBC Shoppers Optimum Banking Account and a RBC Shoppers Optimum MasterCard. You can earn up to 70,000 bonus points and 2.5X more points with the purchase inside Shoppers Drug Mart. As you can see, the return is quite good. If considering the 20X points events, the potential return could be up to 35.8% (it is quite amazing). BTW, Loblaw bought Shoppers Drug Mart for $12.4B in 2013. According to the Shopper Optimum Rewards Program "Terms and Conditions": The Shoppers Optimum Program will terminate at 11:59 p.m. on December 31, 2016. Shoppers Optimum Members will have until March 31, 2017 to redeem Shoppers Optimum Program rewards using Shoppers Optimum Points accumulated up to the Termination Date. Shoppers Optimum Points will expire at 11:59 p.m. on March 31, 2017 and will not be honoured after such expiration date. We may see PC Points Program in Shoppers Drug Mart after that.